Susan graduated from Georgian College in 2007 with a Veterinary technician degree. As a student, Susan was no stranger to Stirling Veterinary team. 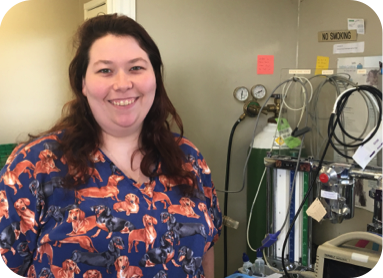 In 2001 she affirmed her interest in Veterinary medicine by pursuing a co-op placement at Stirling Veterinary Services. Upon graduation in 2007, Dr Craig hired her as a staff veterinary technician. Susan is passionate about her profession and loves the patient care responsibiites she has. The veterinary staff is pleased to have Susan as part of our team. Her love of animals and loyality to her fellow team members makes her a great asset. When Susan is not caring for our patients, she is caring for her own crew of furry friends. Susan's clan includes 3 dachshunds (Moleigh, Tayzzer and Benson) and 4 cats (Tattoo, Trinity, Triscuit and Buddy). On the side, Susan is also refining her skills in wood buring craft.